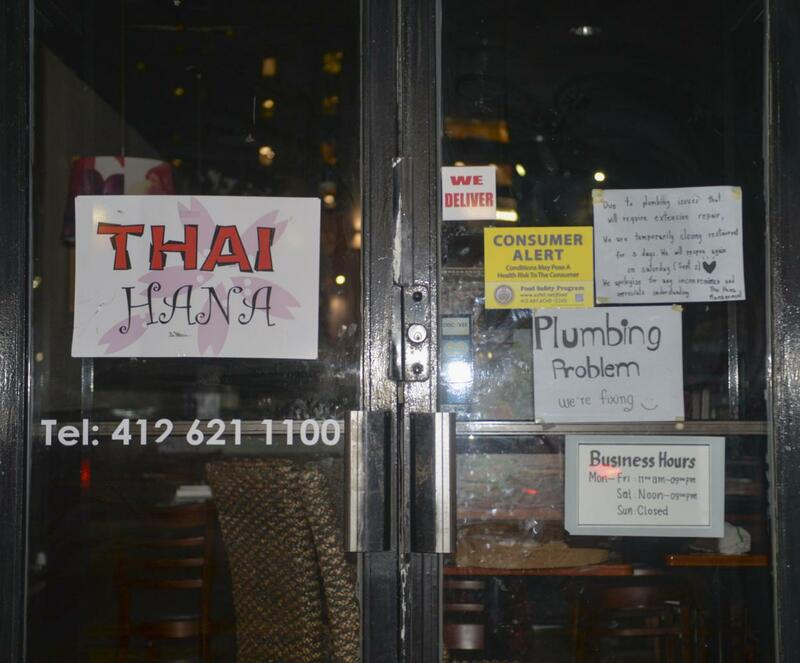 The Allegheny County Health Department issued a consumer alert for Thai Hana and Sushi Bar Tuesday. According to the ACHD, the presence of roaches, flies and bags of rice infested by moths were among the reasons for issuing the alert for the restaurant located on the 3600 block of Fifth Avenue. Other reasons included a dishwasher that was not sanitizing properly, the presence of an unknown liquid leaking from the ceiling and cold food being stored at unsafe temperatures. As of Tuesday afternoon, a sign hung on Thai Hana’s front door saying it is closed for extensive plumbing repairs and will reopen Sept. 2. The ACHD has labeled the restaurant as Priority Code H, meaning that follow-up inspections were conducted on the facility within a five- to seven-month period due to violations in two or more high risk categories — such as employee health and cleaning and sanitation — during an initial inspection. The ACHD conducted a total of four inspections of the restaurant since late July, according to reports on the ACHD’s website. Both the initial report and the three subsequent follow-up inspections leading up to Tuesday showed repeated violations in areas including pest management and employee personal hygiene. The Pitt News made several calls to the restaurant on Wednesday and were met with a voicemail echoing the sign on the restaurant’s door. Thai Hana is not the only restaurant in the Oakland area to receive a consumer alert this past year. Beta Bites — a pizzeria on the 300 block of South Bouquet Street — was found to have several violations in mid-June including no working refrigerator or food safety manager. Peter’s Pub — a bar on the 100 block of Oakland Avenue — was also cited around that time for several reasons including unsafe cooling practices and the use of unapproved pesticides. And Las Palmas — a Mexican grocery and taco stand on the 300 block of Atwood Street — was issued an alert in January for several violations including poor personal hygiene and improper reheating of cooked and cooled items. The health department since resolved these alerts. Editor’s note: This story was updated Thursday to clarify that alerts were resolved for three Oakland restaurants.